Continued my exploration of the south end of Mill Creek yesterday. Needless to say, it’s lovely. Crossing 76th Avenue, I opted to take the unpaved lower path, thinking (correctly) that it would run parallel to the creek. Much to my surprise, but probably no one else’s, less than five minutes into this part of the ravine is a trestle bridge! The bridge crosses over the path in two places. Happily, it’s accessible from the lower trail, so on my way back I took the trestle rather than re-tracing my steps through the woods. The view from the top of the bridge is nice, but the trestle is more visible (and impressive) from below. What an unlikely thing to find in the middle of the ravine. 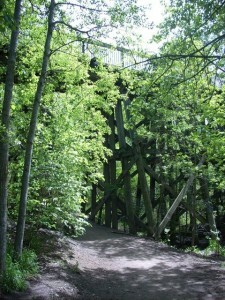 The Mill Creek Trestle Bridge was built at the turn of the last century as a rail connection between Edmonton and the old town of Strathcona. According to the web, after passenger service ended in 1928, the south end of the rail line carried freight to and from various industrial locations, including Gainers packing plant. The old tracks, now paved, no longer support trains hauling locally produced wieners to faraway ports of call, but instead funnels joggers, off-leash dogs, and one very surprised walker (also locally produced), to various corners of the river valley. 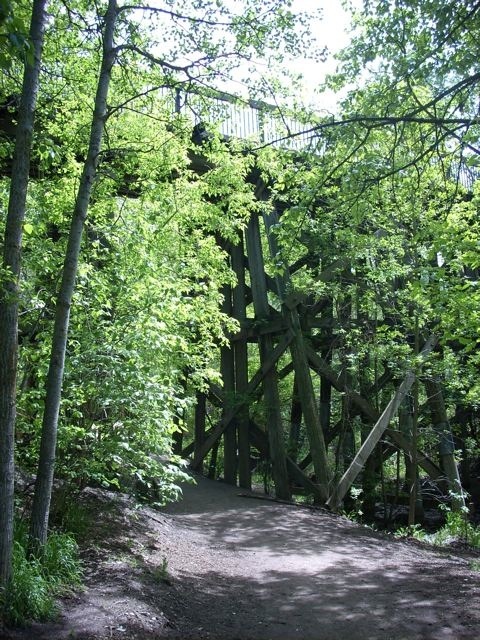 The trestle bridge is a rare reminder of Edmonton’s past, and an exceptionally stunning feature of Mill Creek Ravine. The rest of the trail was nice, but fairly unremarkable. The creek on the south edge of the ravine is so miniscule it’s more of a crick than a creek. I really had to make an effort to find it in some places…and eventually, it kind of just wound itself out. I know the feeling. Today (Saturday), I went old school and walked through Rossdale. Actually, my intentions for this walk went well beyond mere exercise; I was also checking for worms. When I walk home from work, I occasionally use the trail that runs through Rossdale, and in June (sometimes earlier), it is infested by green ash worms. They are not actually worms, but caterpillars, also known as leaf-rollers, and it’s not just one or two…more like hundreds, if not thousands, hanging from long threads in the ash trees along the river like a psychopaths sick joke. I try very hard to avoid the area for the entire month of June, because these tiny green zip-liners make me scream like a four year old. However, I only saw two, which means they’re just starting their hellish life cycle. Rossdale is probably safe for another week, maybe less. Too bad. This neighbourhood is otherwise quite beautiful, just not in June.